Yappy, Spunky and Bossy. This little scrapper has it all! The Yorkshire Terrier is a rambunctious little puppy who is too big for his own body. They are full of personality and will often act as if they are the most important creatures on this world. They also build long lasting bonds with their human owners and are very affectionate towards them. The Yorkshire terrier was developed in the 19th century to become ratters in Yorkshire, England. Because they were bred for the specific purpose of chasing down and catching rats, these dogs, have retained their baser instincts even to this day. Yorkies are extremely small dogs with very long fur. This is what makes them stand out from the rest of the dogs in a crowd. There are two types of Yorkies. Small yorkies and even smaller yorkies which are often called teacup yorkies. These dogs can fit comfortably on your lap without any problems. Puppies can fit inside teacups easily! The best term to define a Yorkie is: “Spunky”. These little dogs can be deceptively ferocious and if not trained out at an early age, could become a problem in the future. They have been known to be very territorial and will bite if they feel threatened. On a positive note, they are very smart and curious about their surroundings. A yorkie puppy will cover wide ground sniffing at unfamiliar things. They can also be a little too fond of attention and will demand it from their owners or people they trust. 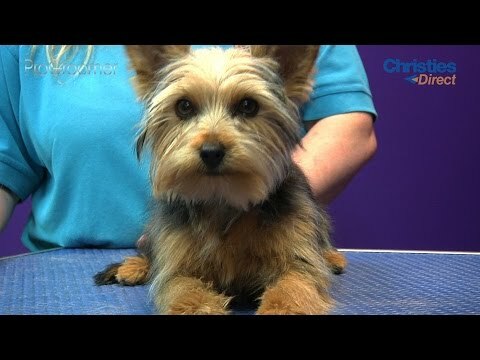 Yorkies may act like they’re impervious to harm but they do come with a unique set of problems. They can suffer from hip dysplasia like other purebred dogs and they also have the tendency to have week patellas. Because Yorkies have high energy levels, it is important to walk them regularly for at least 15 to 30 minutes per day to get all their excess energy out. This exercise can also strengthen their cardiovascular system which can help them avoid any complications stemming from their lungs. 4 Yorkshire Terrier puppies for sale near you. 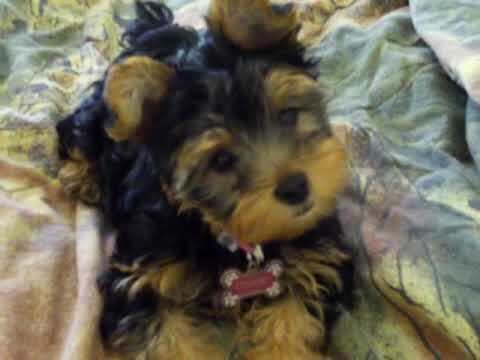 When looking for Yorkshire Terrier dog puppies for sale, this breed may be referred to simply as the Yorkie. The Yorkshire Terrier is named for the city of Yorkshire, England where they originated. This breed was often owned by weavers at clothing mills in 19th century England. This breed was frequently used to catch rats, mice, and other vermin in the clothing mills. This breed was also used to burrow underground and hunt badgers and foxes. The Yorkshire Terrier is a small, toy sized dog with a big personality and a feisty disposition. This breed is oblivious to their small stature and ready for adventure. This breed was recognized by the American Kennel Club (AKC) in 1885 and classified as part of the Toy Group. The Yorkshire Terrier is about 8 or 9 inches tall and averages between 4 and 7 pounds. The average life expectancy for this breed is between 12 and 15 years. Health problems associated with the Yorkshire Terrier puppies for sale include: eye infections, tooth decay, and fragile bones that easily fracture. The Yorkshire Terrier does not like cold climates and is prone to chills. This breed also tends to have a delicate digestive system and tend to be picky eaters. The coat of the Yorkshire Terrier is glossy, fine, and silky in texture and requires daily grooming, many owners choose to have this breed professionally groomed and their hair clipped short. 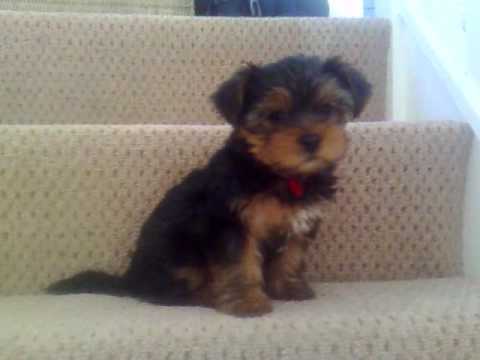 Yorkshire Terrier puppies are born black and tan. Adult coat colors are blue (dark steel-blue) and tan with darker roots. This breed tends to shed very little. When you see Yorkshire Terrier dog puppies for sale and make the decision to make a Yorkshire Terrier a member of your family, you will find this breed an ideal companion animal with a bright and playful nature. The Yorkshire Terrier is very adaptable to their surroundings and due to their size is ideal for apartment living. This breed is never to be considered an outside dog. Due to their small size they do not require much exercise, but do require daily interaction with people. If left to their own devices frequently for lengthy periods of time, they will develop behavior issues and destructive behavior. The size of the Yorkshire Terrier also makes them ideal traveling companions. The Yorkshire Terrier is very affectionate towards people they know, but wary of strangers and make a good watchdog. They do well with children; however, they tend to do better with older children than with toddlers or small children. This breed needs to be socialized at a young age because they tend to be aggressive towards other dogs. The Yorkshire Terrier dog puppies for sale are known to be difficult train especially when it comes to house training; therefore, crate training is recommended for this breed. This breed is also very vocal, and needs to be trained at a young age to correct this issue. 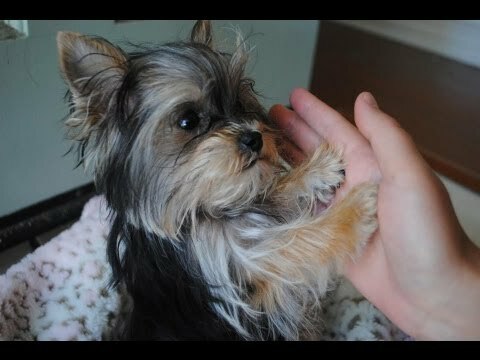 Yorkies are great little dogs who given a chance will be at your side continuously. If you are looking for a close friend, they are a good choice. This is a nice way to make your life easier and save time searching for your Yorkshire Terrier dog’s puppy for sale. Once your email alert is put in place, all you have to do is check your emails regularly! You can create several email alerts, should you wish to do so.